After teaching middle school science in New York, Lois moved to the Chicago area and began volunteering with the Chicago Botanic Garden. Since joining the Echinacea Project in 2009, Lois (aka “the Achene Queen”) has counted over 430,000 achenes! 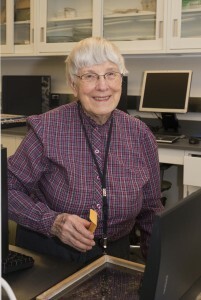 Before teaching the United States, Lois received a Fulbright Fellowship to teach science in Burma and, after her stay in Burma, she traveled around the world writing for the Junior Scholastic Magazine. She has visited over 70 different countries! This is one in a series of profiles recognizing the hard work and dedication of citizen scientists volunteering for the Echinacea Project at the Chicago Botanic Garden.